UNITED NATIONS, January 26 -- On Sri Lanka, Inner City Press has belatedly gotten some UN answers to questions about humanitarian issues it asked more than a week ago. The UN Office for the Coordination of Humanitarian Affairs in the answers it provided today says it “cannot second guess the government” on the fairness of aid distribution, and won't comment on the government ordering the International Committee of the Red Cross out of Northern Sri Lanka, or imposing a burdensome registration process on other NGOs in the country. The questions OCHA provided answers to today were a subset of the Sri Lanka questions Inner City Press initially asked the Office of the Spokesperson for Secretary General Ban Ki-moon, OSSG. Days before Ban Spokesman Martin Nesirky said he wouldn't answer any more questions from Inner City Press unless it acted “appropriately,” apparently meaning not asking about compliance with UN rules, he said “ask OCHA.” So on January 17, Inner City Press emailed the questions to OCHA's spokespeople. Hearing nothing back from OCHA or Nesirky and his Deputy Farhan Haq to whom Inner City Press reverted with the questions, on January 26 Inner City Press asked OCHA deputy Catherine Bragg and them her spokespeople. OCHA said it had given answers to the OSSG. But, perhaps in implementation of Nesirky's threat, the OCHA answers were never given to Inner City Press. What does [the UN] say to the protests in east Batticaloa about allegedly inequitable distribution of aid? WE CANNOT SECOND GUESS THE AID PROVISION OF THE GOVERNMENT, PARTICULARLY AS IT IS PULLING TOGETHER A COMPREHENSIVE POST DISASTER NEEDS ASSESSMENT. IN MAJOR DISASTERS, IT IS NOT ABNORMAL FOR SOME OF THOSE AFFECTED TO WISH AID PROVISION WOULD OCCUR IN A DIFFERENT MANNER THAN IT HAS DONE. WE UNDERSTAND THAT ICRC IS CURRENTLY DISCUSSING THE FUTURE OF ITS OPERATIONS IN SRI LANKA WITH THE AUTHORITIES, AND HAVE NO FURTHER COMMENT AT THIS TIME. PLEASE REFER TO ICRC FOR MORE INFORMATION ON THIS. A GOVERNMENT HAS A RIGHT TO KNOW WHICH NGOS ARE OPERATING WITHIN A COUNTRY, AND TO REQUIRE REGISTRATION. OUR CONCERN HAS ALWAYS BEEN THE ABILITY TO ACCESS POPULATIONS IN NEED OF HUMANITARIAN AID. I AM NOT AWARE OF ANY DIFFICULTIES IN OBTAINING THIS VISA NOR OR ANY TRAVEL RESTRICTIONS ON IT. Ban's Spokesperson's Office, despite Ban's December 17 and January 14 statements that Ban's Panel on Accountability in Sri Lanka could travel to the country due to President Mahinda Rajapaksa's “flexibility,” has been unwilling to answer specific questions about visas for the Panel and conditions the government would impose. Now they have been asked other questions. Watch this site. 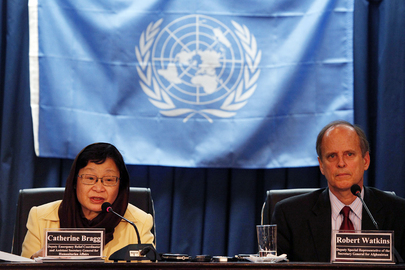 UN's Ban and his Panel: supposedly UNfair to judge, but where are they? UNITED NATIONS, January 22 -- The UN, after moving to refuse to answer any Press questions about Sri Lanka, has decided to publicly re-confirm that Secretary General Ban Ki-moon's Accountability Panel is no longer slated to travel to Sri Lanka. As Inner City Press reported on January 18, this is contrary to Ban's December 17 praise of President Mahinda Rajapaksa's "flexibility" in allowing the visit, and to Ban's January 14 answer to Inner City Press. But the UN does not want to explain, or even be asked about, these accumulating discrepancies. Inner City Press: ...the Panel does not go to Sri Lanka. That in fact letters have been exchanged and that a letter from Sri Lanka says that there’s no intention to speak to the Panel. Spokesperson: Well, what I can tell you is that Ms. Bragg’s visit it obviously a humanitarian visit. It is not related to work of the Panel. It is not. And I think that’s quite clear. Question: What happens now? What will she do with it, as a humanitarian individual? Spokesperson: She will be talking about humanitarian matters. Spokesperson: As I said, the two are not connected. This is clearly a humanitarian matter. Last question. The next day on January 19, Nesirky twice cut off Inner City Press from asking questions at the UN noon briefing, claiming he would answer questions put to him in writing. Inner City Press posed a number of Sri Lanka questions about the visas and Ban Ki-moon, none of which Mr. Nesirky answered. On January 20, Nesirky walked out of the briefing room while Inner City Press was still posing questions about the white flag killings in connection with an article including the role of Ban's chief of staff Vijay Nambiar, who has said he got assurances from Sri Lanka Permanent Representative Palitha Kohona that those with white flags would not be killed. Nesirky spoke of a reply from Mr. Nambiar, which has yet to be provided. Finally on January 21, Nesirky told Inner City Press at the noon briefing that “I will take questions from you when you behave in an appropriate manner,” and refused to take any more of questions Inner City Press had prepared, including Sri Lanka and Ban's statements about his Panel. Colloquially, this "sucked," and Inner City Press quickly wrote about it. This is how Ban's UN, especially but not only Ban's Spokesperson's Office, operates. 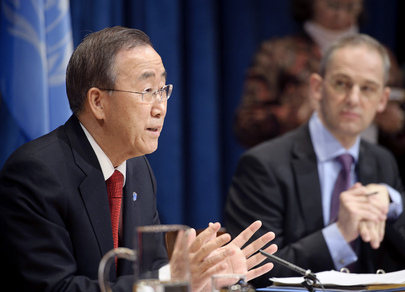 A major question still unanswered, but repeatedly asked by Inner City Press publicly in the noon briefings at which Nesirky on January 21 said he will take no more questions from Inner City Press, is why Ban Ki-moon claimed on December 17 that his Panel would go to Sri Lanka. At that time, Ban went out of his way to praise President Mahinda Rajapaksa's “flexibility.” Nesirky has repeated refused to answer Inner City Press' factual questions about Ban's, his entourage and family's contacts with Sri Lanka and Rajapaksa. Now, after Inner City Press publicly asked and wrote about the letters between Sri Lanka and the UN which contradict what Ban has said, and after Nesirky said he will not take any more questions from Inner City Press, a “senior UN official” issues the above-quoted, without any reference to Ban's December 17 (and January 14) claims. Watch this site.